In 2006, High School Musical caught us completely unaware. It was fresh, energetic and a lot of fun. The musical numbers were on point and met a cast of unforgettable and relatable characters. Fast forward ten years and we have Disney’s latest offering, The Lodge. It’s the British teen television musical we’ve always wanted, packed full of catchy music, lovable characters and bags of drama. The Lodge follows Skye (Sophie Simnett), a determined young girl who moves to the country to make a success of her family’s ailing lodge business. Mystery, romance and drama awaits as Skye discovers a new lease of life, adventures and friendships she could never have imagined. What’s more, the soundtrack to Skye’s life affirming journey includes some of the catchiest tunes you’ll hear all year. 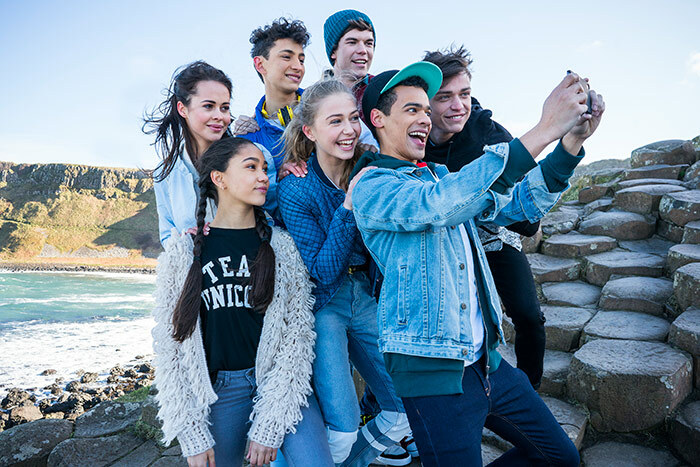 We spoke to stars of The Lodge Jade Alleyne (Kaylee), Jayden Revri (Noah), Bethan Wright (Danielle) and Joshua Sinclair-Evans (Josh) about being on Britain’s first Disney musical TV show, the many memorable musical numbers and their hilarious behind-the-scenes pranks. How does being British mean The Lodge is different to High School Musical? Jayden: It’s a lot more serious in some ways, like the stories inside each of the episodes. You figure out many more things as the series goes on and there’s like a sense of realism to the series. [High School Musical] is a bit cheesy. This show does have it’s cheesy moments, but it’s quite a serious series – it’s very relatable. What was it about the script that drew you to the series? What did you like about The Lodge? Josh: I actually laughed when I read it. That was the main thing, I actually found it really funny. So often with kids shows, there’s so much for the kids but there’s not so much for older people. But [The Lodge] has got jokes for them as well. Everyone can enjoy it. Jayden: Every episode ends with a cliffhanger. Reading the script, as soon as you finish one it’s like I need to know what happens in the next one. And then before you know it you’ve read ten scripts and you’re like ‘wow, when’s the next one coming out?’. Do you guys have a favourite song from the show? Jayden: My favourite song from this series is “Never Let You Go”. Me and Jade sing that as a duet in the series. It’s such a beautiful moment where obviously our characters have been through a bit of a journey together. Jade: What I love is that there’s not one song that I dislike. If I had to give a favourite, it would probably be between “Believe That” and “If You Only Knew”. “Believe That” is such a fun, punchy song whereas “If You Only Knew” is a bit more emotional and you can really get into what you’re feeling at the same time as you sing it, which I really like about it. Bethan: I’d say “Believe That” as well, because it’s about fighting hard and believing in yourself – it’s got great morals behind it. Josh: I think mine’s probably “What I’ve Been Wishing For”, because I hadn’t heard any of the songs before. The first time I heard it was them all singing it. It gave me goosebumps when I heard it. Jade: “What I’ve Been Wishing For” we sing as a group around a campfire, it’s a really nice moment. Jade: At first I didn’t know how I felt about Kaylee’s shyness. I [didn’t know how] to play it because I wanted to be shy but at the same time I didn’t want to be not exciting enough. As I did a bit more with the character, I came to love Kaylee’s shyness because it’s what makes her Kaylee. Bethan: Danielle’s a pretty mean girl so um… She’s pretty sensitive actually, which you wouldn’t really see from the outside. You’ll see as the series progresses – you’ll be like oh, I kind of get why she’s being such a mean girl. Josh: I think my favourite thing about Josh is probably how positive he is. And just how much energy he has all time. Possibly if you were around him for too long, you’d need to take a break. He’s just so comfortable with being himself – which is an amazing thing I think. Bethan: Skye actually moved away from you. Josh: Yeah I know. That’s actually what the series is about. Jayden: My favourite thing about Noah is heart. I think he’s got really nice heart. Throughout the series I think he’s a very relatable character for young teenage boys. The fact may be that his head is always over here over there, but his heart is always in the right place. There’s a spark of romance between Kaylee and Noah – do you think they work well together? Jade: I do think they go really well together. They’re both best friends and they both have a secret crush on each other, but they are both a bit nervous that would ruin their friendship. I don’t want to give too much away, but I think it’s a pretty nice relationship to watch. Bethan, what do you think makes Danielle the way she is? You can see she’s vulnerable underneath her bravado. Is it to do with her mother? Bethan: Her mother is very strong, she’s very business-y, so I guess she gets part of it from her. Sean is with Danielle for a bit of a trophy, which is not all that nice and I think she knows that deep down as well. Jayden: Her parents have split up in the series as well, so I feel like it’s this thing where she doesn’t really talk to her dad that much It’s quite hard for her. I feel like the anger – because her mum is so strong she doesn’t really like to talk to her mum about it that much – she takes it out on the other characters. Josh, you’re a bit isolated in the show because you’re living in the city. Are you planning to join them at any point or are you staying on the smartphone? Josh: He spends most of his time in the city. He likes to be on the end of the phone to give Skye a word of advice – and maybe a judgemental one or two. He’s her safety net. He might try and [visit the lodge] eventually… but most of the time he just stays on the phone. Jayden: Maybe in the first series, he might come over. Do you have any funny stories from behind the scenes? In unison: We’ve got a few! Bethan: Okay so there was a scene where I was told to go inside the tent, zip it up, and wait about ten seconds and little did I know on the other side of the tent everybody – the cast, crew, everybody – were told to go and hide on the call of action. So they were like okay, action, I unzipped the tent, I emerged – there was nobody there! Jayden: So what did you do, Bethan? Bethan: I carried on acting. Bethan: I didn’t know if to stop or not! I thought maybe they just want it to be more realistic, you know? Then I was like, hang on a minute, this is a prank. I was so confused. Bethan: Yes, of course they did. Is that going on the DVD extras? Jayden: One the funniest things for me was April Fools Day. I knew Jade had something planned. She was being really sly and I was like ‘something bad is gonna happen’. We went out for dinner and she nicked my room key out of my pocket somehow – I have no idea how – and I went to go to the shop. I come back and go into my bathroom. My sink is full of cheerios with a spoon in, a tub of milk and a little note saying ‘tuck in mate’. Jade: I thought you didn’t like the early wake ups so I thought I’d bring your breakfast to you! Do you at least like cheerios? Jayden: I do like cheerios, but I thought it was quite a funny thing because I was always late for breakfast. It was a nice gesture in some ways, right? Jade: I feel quite bad for Jayden actually with the pranks. There was this day when Jayden was out eating dinner and me and Sophie snuck out with the room key and we went round his room and cling filmed his whole bed, his desk, some of his belongings – it was absolutely hilarious! Jayden: I was not impressed. Bethan: The reaction – it was like [squeaks] ‘I’m gonna get her!’. Jade: I think I’ve got to watch my back if we ever film a series two! Jayden: I’m gonna get her back, don’t worry about that. 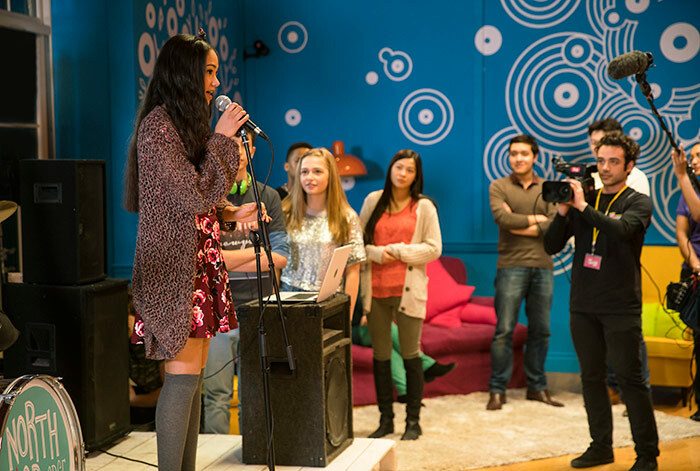 Disney’s The Lodge airs on Disney Channel, Fridays at 5.30pm from 23rd September.